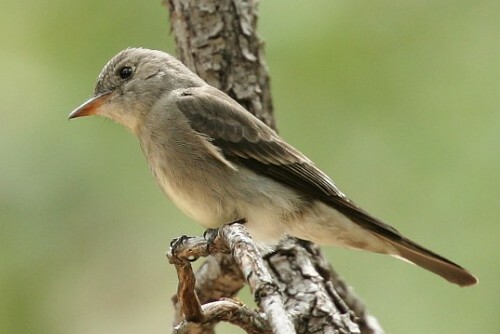 This Western Wood-Pewee was photographed in Hidalgo County, New Mexico, June 1, 2003. The image is copyrighted by Robert Shantz. If you're hiking through one of Arizona's sycamore gallery woodlands and you see a bird flit and and at the same time hear a clack sound chances are it was a Western Wood-Pewee. These birds catch their dinner on the wing, mostly small insects, and the sound is made as they return to their hunting perch. Willows and cottonwoods are good places to find them. The eyes have no white ring and the wing bars are mostly too faint to see; also notice the orange lower half of beak. Some characteristics to notice: There is no eye ring. Wing bars are present, but faint. The lower mandible of the bill is light/orange color. The head, chest and belly are almost uniform pale gray. The bird is small, about the size of a house finch. But notice the slender bill adapted for eating soft-bodied insects.